I hope you are all enjoying the summer as much as I have been. I have been traveling all over the greater Chicago area simply to enjoy all the foods and drinks this great city has to offer. Going out 3-4 times a week is such a fun time with your friends, especially when good foods and drinks are involved. One part of me enjoys eating out so much, another part of me says that I need to watch out, and please get back to the routine of well balance in between each meal throughout the day. If you have been following my journey, you would know that I have addicted smoothies as my breakfast routine. This summer I decided to take time and make a variety of breakfast bowls. I make more chia seed pudding, overnight oatmeal, smoothie bowl, and granola. I would say every single bowl I create is my favorite; I find something good out of each bowl. This part allows me to get super excited about discovering more and more ways to pairing all ingredients together. The base ingredient here is granola; crunchiness makes your bowl more enjoyable. 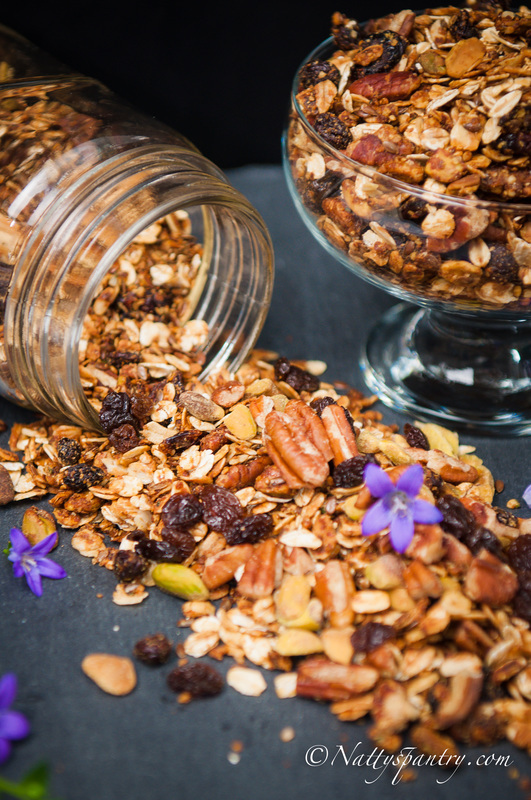 Homemade Granola can be a healthy meal, snack, or treat. 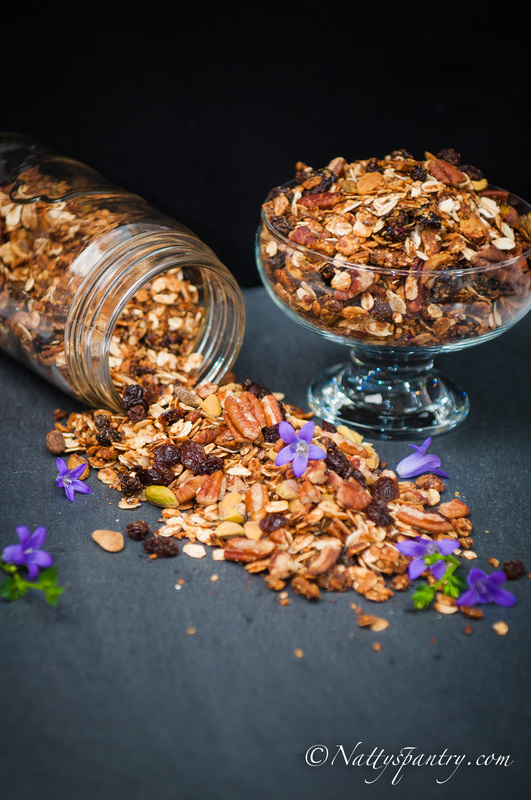 Most of the granola you find stores are packed with high sugar and contain unnecessary ingredients. 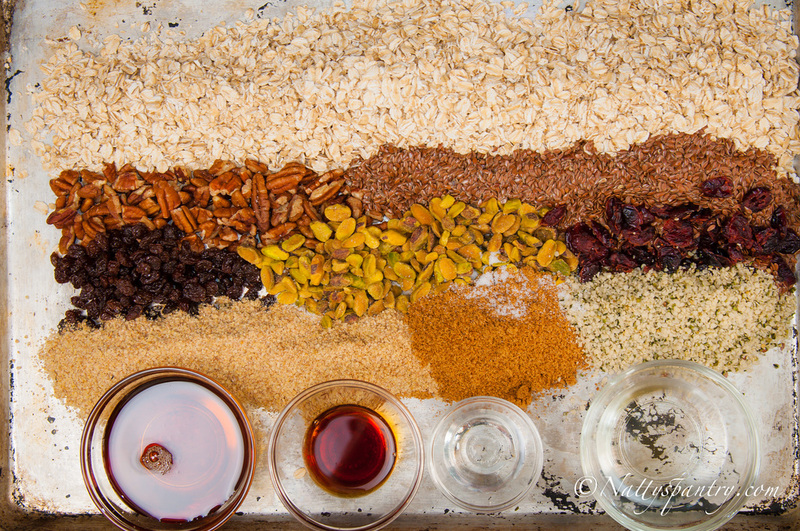 Taking time to make your own granola is super easy, and allows you to control the amount of fat and sugar. Also, you can choose your favorite nuts and add in flavors of your own desire. Old-fashioned oats are a breakfast staple that is healthy, has a chewy texture, and also a popular choice for baking. Nuts and seeds: This recipe I used pecans and pistachios, both are my favorite, and it is pairing well with the orange flavor. Also, I used wheat germ, and raw shelled hemp seed. Wheat germ is a good source of B vitamins such as folate, Fiber, Iron, and Omega-3. Other optional including walnut, green pumpkin seeds, cashew, almond, peanuts, macadamias, and sunflower seeds. Raw shelled hemp seeds offer a good source of plant-based protein, amino acids, and Omega fatty acids. Fats: Healthy fat is a great option to control your diet, and it is healthier than processed fats. Fat keep the granola crisp. I prefer coconut oil, which adding the nutty flavor into it. Another option is olive oil. Flavors: I used orange zest and orange flower water, to add more fragrance and a sweet flavor. Other options are lemon zest, cinnamon, nutmeg, and vanilla. 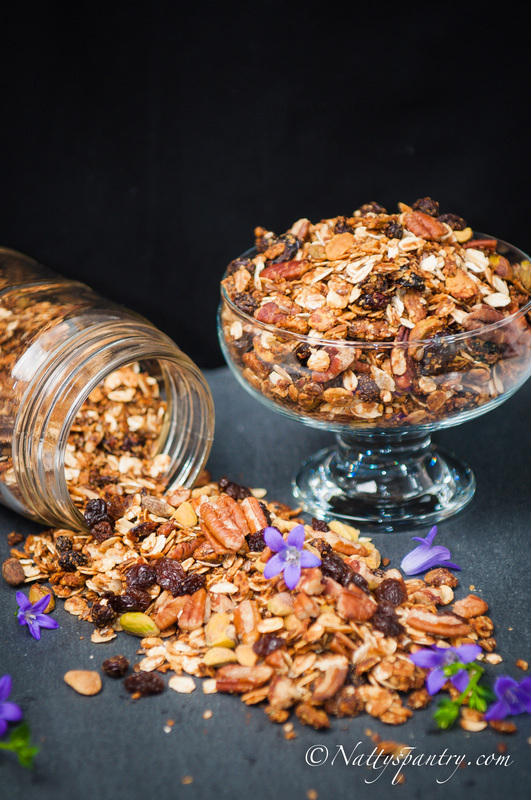 Dried fruit: I would suggest adding dried raisins and dried cranberries once the granola has cooled. For me personally, I add dried fruit before baking to add an extra crunch to it. This recipe makes about 4 and a half cups of granola. It is a great weekend project that you can stock up for the week, or even a healthy snack keep up through the week. Here are 5 granolas breakfast bowl ideas for you to play around with and make your morning more fun than ever, or you can just pour milk and some fresh fruit on top and enjoy. Don't forget to grab something healthy to munch on during the day or one meal a day. In a large bowl combine the oats, nuts, seeds, wheat germ, and brown sugar. In a separate small bowl combine agave syrup, coconut oil, vanilla extract, orange flower water, orange zest, and salt. Combine both mixtures well. Transfer the mixture to a baking pan. Cook for 75 minutes, keep stirring every 15 minutes. Bake until the color turns golden brown.